Rajasthan has so much to see, with long travel distances between top sites, that a trip here requires careful planning (particularly if you hire a car and driver, which is the best way to tour the state). The following overview can help you plan your itinerary. The three biggest cities in Rajasthan, all with airports, are Jaipur, the “Pink City”; Jodhpur, the “Blue City”; and Udaipur, the “White City.” All are worthwhile destinations, not least because they offer easy access to great excursions. The tiny Jaisalmer, or “Golden City,” is the most awkward to reach, and while some find it the highlight of their Rajasthan trip, others feel it isn’t worth the schlep it takes to get there, especially with its decaying fort and its untrammeled development. 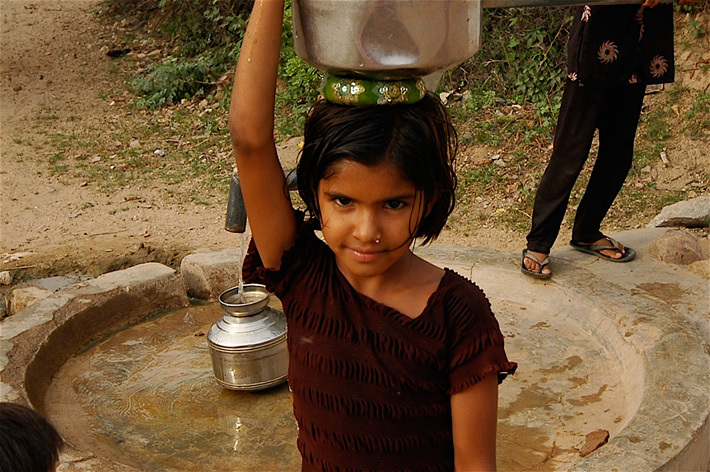 For most, the entry point is the state capital of Jaipur, near the eastern border, which is the third point (the others being nearby Delhi and Agra) of the much-traveled Golden Triangle. 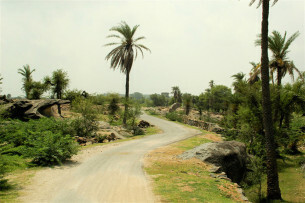 Should you choose to start your trip here, you are in fact well positioned to visit some of Rajasthan’s top sites: Only a few hours from the city is Ranthambhore National Park—where you have good chances of spotting a wild tiger––and Bharatpur’s Keoladeo National Park, a must-see for birders, and literally on the way from Agra. 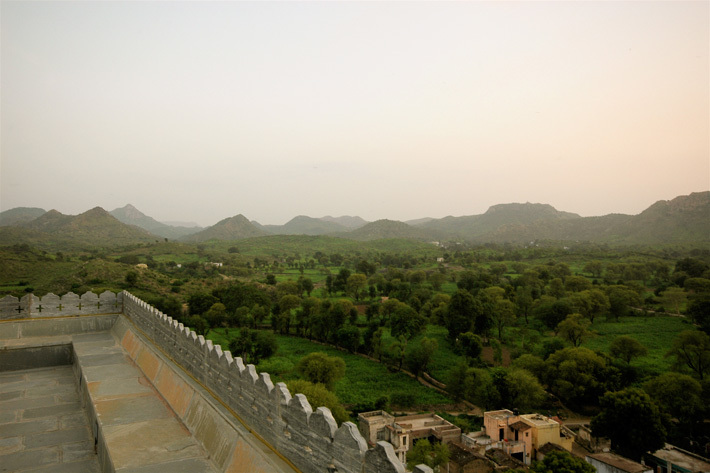 Jaipur is also within driving distance of Shekhawati and its painted towns and is also the start of the beautiful Aravalli’s that are home to unique, specialty boutique hotels. Other than its proximity to these sites, however, as well as the excellent rail and flight connections to the rest of India, the only good reason to dally in Jaipur itself is to indulge in some retail therapy. Most visitors planning to travel farther by car circle Rajasthan in a counterclockwise direction, starting off in Jaipur and traveling the rather circuitous route west to Jodhpur (with a short sojourn in Pushkar— particularly for younger travelers); then, from Jodhpur, you could make the 5[bf]1/2- to 6-hour drive west to Jaisalmer for a few nights before you return to Jodhpur. An alternative route to Jaisalmer, which means you don’t have to travel both to and from Jodhpur, is to travel from Delhi through the Shekhawati region to Mandawa, known for its painted havelis, and from there on to Jaisalmer, before you travel east again to Jodhpur. (The other alternative is to skip Jaisalmer altogether, and if you’re short on time this is what you may have to doFrom Jodhpur you then travel south to Udaipur and, after lingering in the Aravalli Hills and its charming lodgings (Mihir Garh, Rawla Narlai), finally, head back north to Jaipur, stopping en route at one of many lovely palace hotels (or at Shahpurah Bagh or Amanbagh) for a most relaxing end to your journey. For someone with limited time (say, only enough to visit one of Rajasthan’s cities), it’s far better to fly direct to Udaipur—with great lodging options in all price brackets, this is arguably Rajasthan’s most attractive city (though you should check the status of the lakes, which have gone dry for an entire season in recent years, before planning your entire trip around it). From Udaipur you can take a wonderful (but long) day trip to Kumbhalgarh Reserve to take in Ranakpur’s exquisitely carved Jain temples and impressive Kumbhalgarh Fort before overnighting at Devi Garh, reputed to be one of India’s top hotels or push a little further into the Aravalli countryside and spend a few days at Rawla Narlai, one of our favourite places to linger. Alternatively, you can head east from Udaipur pausing at Shaphura Bagh for serious downtime in an otherwise city-based itinerary, via the historic fort of Chittaurgarh, and then move on to Ranthambhore National Park. 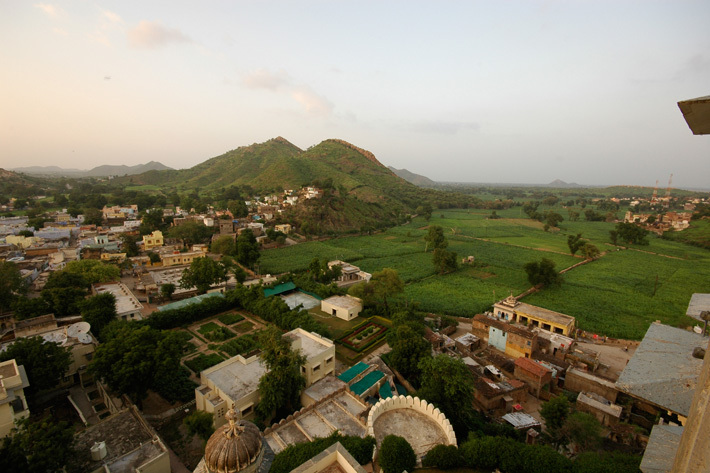 Or take the short trip directly south to the relatively undiscovered palaces of Dungarpur (and stay at Udai Bilas), or head much further out west to Mount Abu, the state’s only hill station and sacred pilgrimage of the Jains, who come to visit the famous Dilwara Temples. Jodhpur and its majestic Mehrangarh Fort lie only 5 hours north of Udaipur by road, and you can break up the trip by overnighting at one of the recommended heritage properties along the way. As mentioned, the state’s other fascinating but endangered city is Jaisalmer, which is rather inconveniently situated on the far-flung western outreaches of Rajasthan’s Thar Desert; of course, its remote setting is greatly responsible for its desirability as a destination. To get there, you have to either set off from Jodhpur, or travel via the desert town of Bikaner (but it is advised to stay 30km outside at Gajner Palace or use Mandawa as your base)—both routes involve a lot of driving (Jodhpur is a 5[bf]1/2- to 6-hr. drive away; Bikaner a 6- to 7-hr. drive). You can opt to travel from Jodhpur to Jaisalmer by overnight train, but make sure to get a berth in the air-conditioned compartment of the Delhi–Jaisalmer Express (even though the desert nights can be bitterly cold, this is your best option until Jaisalmer’s airport arrives) and carry a warm blanket. You can fly between Rajasthan’s major cities and hire a vehicle and driver from one of the recommended operators for the duration of your stay in each region, but the long-term hire of a car and driver is highly recommended—this is really the best way to tour Rajasthan because it means you can travel at your own pace, avoid public transport (or the daily grind of haggling with taxis), and get right off the beaten track. That said, Rajasthan’s potholed roads make for slow going, drivers have unknown rules (but clearly the big trucks and cows rule, no matter what the circumstances), and traveling by night is only for the suicidal—even day trips will have you closing your eyes in supplication to some higher being. Many operators are not keen to provide a breakdown of pricing, leaving you with the distinct feeling that you are being ripped off. To avoid this, get a per-kilometer rate for the specific kind of car you wish to hire, and the overnight supplement for the driver. For a trustworthy and reputable transport and logistics contact, who provides fluent english-speaking Tourist Licensed Drivers (with 3-year license reviews) at bona-fide rates. 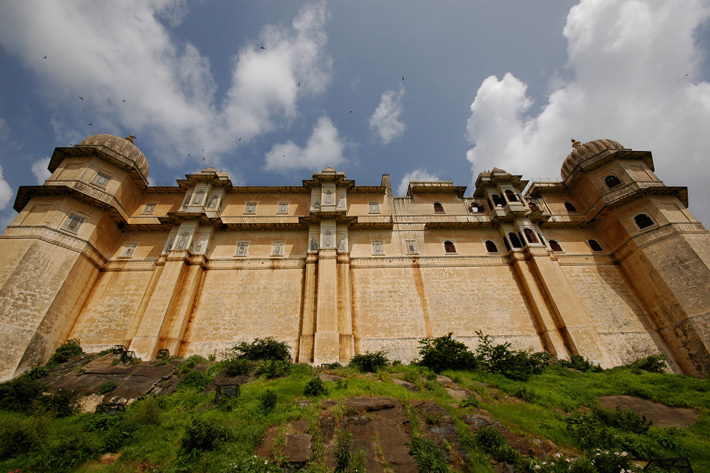 contact Kawaljeet Singh of Maavalan Indian Travels (kawaljeet@maavalanindiatravels.com; + 91 11 26511634). At press time, an air-conditioned car (a standard small sedan such as a Tata Indigo) and driver in Jaipur cost about Rs 1,450 for a full day (8 hr. ), up to 80km (50 miles), plus a negotiated fee for every hour after that. For out-of-town trips, expect to pay Rs 7.50 to Rs 10 per kilometer plus Rs 200 per night out. A romantic way to go is in an air-conditioned Ambassador, India’s quaint homegrown brand of sedans, which provides you with a real sense of being in another world, not to mention another era. They’re also pretty hardy but can be unpredictable and are best used for city touring. The best organized travel company in Rajasthan is Maavalan India Travels(www. maavalanindiatravels.com) which has branches and expert agents in each of the main cities; rates are a little pricier than you’ll find elsewhere, but they’re fixed, so there’s no bargaining, and service and local knowledge is of an excellent standard. Note: At press time, tax on Rajasthan hotel accommodation varied between 8% and 10% (depending on the city), although this does not apply to economy rooms; sales tax of 12.5% is charged on dining bills. Souvenir Journeys is a growing collection of the finest boutique residences and experiences throughout India and Africa owned by passionate individuals who are devoted to what they do. In Search of Spices – a Keralan Journey Why book with us?